Carlos Joaquin Ruiz…along with wife Haidee, has two sons: Carlos Ricardo and Carlos…signed by Allan Lewis. The Totals - Hit .264 (53x201) with 8 doubles, 3 home runs and 15 RBI in 62 games with Philadelphia and Los Angeles-NL... The Trade - Acquired by the Dodgers from Philadelphia in exchange for A.J. Ellis (c), Tommy Bergjans (rhp) and Joey Curletta (of) on Aug. 25... Dodger Time - In 14 games with the Dodgers, hit .278 (10x36) with 2 doubles and 3 RBI...With Philly - Prior to the trade, hit hit .261 (43x165) with 6 doubles, 3 home runs and 12 RBI in 48 games with the Phillies... For Starters - Made his 8th career Opening Day start for the Phillies (2008-12, 2014-16) on April 4 at Cincinnati... Playoffs - Made his 6th career postseason appearance, his first with the Dodgers…hit .273 (3x11) with 2 runs, 1 double, 1 home run, 4 RBI and 1 walk in 7 games. Earned his 1st All-Star selection; caught the final 4.0innings in the NL's 8-0 win at KC... Set career highs in hits (121), doubles (32), HR (16), RBI (68), runs (56), XBH (48), total bases (201), SF (4) &HBP (16)... Led all NL catchers in doubles and T-2nd in XBH (47)... Ranked 2nd in the NL in HBP... Went 3-for-5, 2 2B, HR and a career-high 7 RBI, 5/2 atATL, falling one RBI short of the club record; became the1st catcher in Phillies history with 7 RBI in a game... Was on the 15-day DL, 8/4 (retroactive to 8/3)-9/6 withplantar fasciitis in his left foot (partial tear)... At the time he went on the DL, was ranked 4th in the NLin AVG (.335), 5th in OBP (.399) & SLG % (.559) and T-7thin doubles (28); was also leading all NL catchers indoubles, runs (47), XBH (42) & total bases (175) and wasleading all ML catchers in CS (21)... Batted .405 (34-84) with RISP from 4/25 through theremainder of the season after starting 1-for-11... Of his 16 HR, 4 gave the Phillies a lead and 2 tied the game... Homered in back-to-back games 3 times: 5/2 & 4, 6/26-27 and 7/3-4... Caught a career-high 21 of 85 potential base stealers(24.7%)... Finished 7th among NL catchers in CS... Received a 25-game suspension after testing positive foran amphetamine in violation of MLB's Joint DrugPrevention and Treatment Program on 11/27. Finished with the best catcher's ERA (3.06) in MLB. ... Threw out 18 of 95 potential basestealers (18.9%); T-9th in the NL with 18 runners thrown out. ... The Phillies went 70-43 (.619) in his starts. ... Slugged his 1st career pinch HR and grand slam, 4/9 at ATL (Scott Linebrink); also set a career high with five RBI despite not entering the game until the seventh inning. ... Was on the 15-day DL, 5/8-12 (backdated to 4/28) withlower back inflammation; originally left the game, 4/27 at ARI (after 1 AB) with lower back tightness; went 2-for-9, RBI in two extended spring training games as DH, 5/10-11 and also rehabbed with Clearwater (A). ... Tied his career high with four hits twice: 6/21 at STL and 9/25 at NYM. ... Had a career-best 11-game hitting streak, 7/8-25 (.394, 13-33, 4 2B, HR, 5 RBI, .606 SLG %). ... Hit .342 (40-117) in his final 36 games. ... Batted .316 (56-177) against NL East teams. The Phillies went 55-37 (.598) in his 92 starts...Threw out 14 of 79 potential basestealers (17.7%)...Had the 3rd-lowest catcher's ERA (3.83) in the NL...Set a career high with 4 hits, 6/13 at STL (4-6, 2 2B, 4 RBI)...Played 3rd base for the first time in his professionalcareer, 8/26 vs NYM (1.0 inning)...Batted .429 (6-14), 11 RBI with the bases loaded...Started every postseason game at catcher and hitsafely in 8 of the 14 games...Had a walk-off infield single in the bottom of the 9thinning in Game 3 of the World Series, 10/25 vs TB. First full season in the majors... Threw out 19 of 76 potential basestealers (25%)... Finished 3rdamong NL rookies in walks (42), 5th in doubles (29), 8th in RBI (54),T-8th in multi-hit games (27) andextra-base hits (37), 9th in total bases (148) and OBP (.340) and 10th in hits (97), HR (6) and runs (42)... Hit .322 (19-59), 10RBI in his first 16 games of the season... Hit his 1st career walk-off HR, 5/15 vs MIL (Derrick Turnbow)... Stole home, 6/26 vsCIN, becoming the first Phillie to do so since 1997 (Scott Rolen) and first Phillies catcher since 1982 (Bo Diaz)... Also had aseason-best 4 RBI the same night vs CIN... His 6 SB were the most by a Phillies catcher since 1992, when Darren Daultonstole 11 and 3rd-most since 1950 (Daulton had 7 in 1990)... Was T-3rd in pickoffs among all MLB catchers (4), trailing MiguelOlivo (8) and Jeff Mathis (7)... Did not make an error in his first 76 starts and finished T-2nd among all MLB catchers in fewesterrors committed (2 - min. 100 games played)... Had 27 multi-hit games, including four 3-hit games... Hit .311 (19-61) in 17June games... The Phillies went 13-5 (.722) in his final 18 starts. Played for Panama in the inaugural World Baseball Classic...Shuttled between the Phillies andScranton/Wilkes-Barre (AAA) all season...Began the season with Scranton, where he finished 3rdin the International League in batting average (.307), 2nd in on-base % (.389) and 5th in slugging % (.505)...Was amidseason and postseason All-Star...Batted safely in 16 of his first 21 games with 11 multi-hit games...Phillies MinorLeague Player of the Week, 4/17-23 (.462, 1 HR, 4 RBI)...Was leading the IL in batting average (.385) and ranked 2nd in HR(6) at the time of his 1st recall on 5/5...Made his ML debut in a start, 5/6 vs SF...Collected his 1st ML hit, 5/9 vs NYM (PedroMartinez)...Optioned back to Scranton on 5/29...Recalled on 7/4 and slugged his 1st ML home run that day vs SD (ClayHensley)...Optioned on 7/15...Was recalled for the 3rd and final time of the season on 8/31...Batted .393 (11-28), 3 HR, 9RBI over an 11-game span covering 2 major league stints, 7/4-9/23...Threw out 26 of 74 attempted base stealers withScranton (35%); 2 of 13 in the majors (15%). Played for Scranton/Wilkes-Barre (AAA)...Reached professional highs in hits (104),runs (50), doubles (25) and walks (30)...Played 56 games at C, 32 as DH and 2 at 1B...Hit just .219 (16-73) through his first 22 games before hitting .318 (87-274) the remainder of the season (6/9-9/5)...Batted .515 (17-33), 5 2B, 13B and 8 RBI over an 8-game span, 7/1-8, raising his average from .265 to .315; 7 of the 8 games were multi-hit games...Collected a season-high 4 hits, 7/16 at Columbus...Had 27 multi-hit games...it .556 (5-9), 3 2B, 3 RBI as a pinch-hitter...Defensively, caught 13 of 42 potential base stealers (31%). Spent his entire season with Reading (AA)...His 17 HR were 2nd among Eastern League catchers(Eli Whiteside, Bowie, 18)...Threw out 32.9% (25-76) of potential basestealers...Placed on the DL on 5/6(concussion)...Activated on 5/13...Hit .333 (27-81), 8 HR, 19 RBI in June...Homered in back-to-back gamestwice...Had a season-best 10-game hitting streak, 7/11-7/24 (.417)...Clubbed a season-high 2 HR, including thegame-winning walk-off blast in the bottom of the 9th inning, 8/23 vs New Britain...Hit .343 (23-67) over his final17 games...Played in the Arizona Fall League. Inbox: Could Hamels reunite with Phillies? 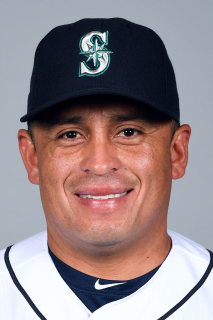 November 2, 2017 C Carlos Ruiz elected free agency. August 26, 2016 Los Angeles Dodgers activated C Carlos Ruiz. July 23, 2014 Philadelphia Phillies activated C Carlos Ruiz from the 15-day disabled list. July 17, 2014 Philadelphia Phillies sent C Carlos Ruiz on a rehab assignment to Clearwater Threshers. November 21, 2013 Philadelphia Phillies signed free agent C Carlos Ruiz. June 18, 2013 Philadelphia Phillies activated C Carlos Ruiz from the 15-day disabled list. June 15, 2013 Philadelphia Phillies sent C Carlos Ruiz on a rehab assignment to Lehigh Valley IronPigs. May 21, 2013 Philadelphia Phillies placed C Carlos Ruiz on the 15-day disabled list retroactive to May 20, 2013. Right hamstring strain. April 28, 2013 Philadelphia Phillies activated C Carlos Ruiz from the restricted list. April 26, 2013 sent C Carlos Ruiz on a rehab assignment to Reading Fightin Phils. April 23, 2013 sent C Carlos Ruiz on a rehab assignment to Clearwater Threshers. February 24, 2013 Carlos Ruiz roster status changed by Philadelphia Phillies. November 27, 2012 Philadelphia Phillies placed C Carlos Ruiz on the restricted list. November 27, 2012 Carlos Ruiz roster status changed by Philadelphia Phillies. September 7, 2012 Philadelphia Phillies activated C Carlos Ruiz from the 15-day disabled list. August 4, 2012 Philadelphia Phillies placed C Carlos Ruiz on the 15-day disabled list retroactive to August 3, 2012. Plantar fasciitis in his left foot. May 13, 2011 Philadelphia Phillies activated C Carlos Ruiz from the 15-day disabled list. May 12, 2011 sent C Carlos Ruiz on a rehab assignment to Clearwater Threshers. July 10, 2010 Philadelphia Phillies activated C Carlos Ruiz from the 15-day disabled list. July 8, 2010 Lehigh Valley IronPigs sent C Carlos Ruiz on a rehab assignment to Lakewood BlueClaws. July 7, 2010 C Carlos Ruiz assigned to Lehigh Valley IronPigs. June 22, 2010 Philadelphia Phillies placed C Carlos Ruiz on the 15-day disabled list retroactive to June 19, 2009. Concussion. May 2, 2009 Philadelphia Phillies activated C Carlos Ruiz from the 15-day disabled list. April 30, 2009 Reading Phillies sent C Carlos Ruiz on a rehab assignment to Lehigh Valley IronPigs. April 28, 2009 Philadelphia Phillies sent C Carlos Ruiz on a rehab assignment to Reading Phillies. April 25, 2009 Philadelphia Phillies sent C Carlos Ruiz on a rehab assignment to Lehigh Valley IronPigs. April 11, 2009 C Carlos Ruiz assigned to Philadelphia Phillies.